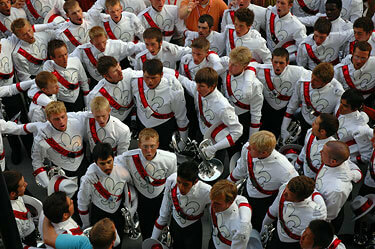 November marked the unofficial start to the 2007 season as many corps hosted the first of their annual auditions. DCI.org has asked directors and staff members for their tips to help you on your way to becoming a member of the world's most elite and exclusive marching music ensembles. Many corps still have opportunities for auditions in December. Visit your favorite corps' Web sites to find their most complete and up-to-date auditioning information. Practice hard and good luck! Madison Scouts; Aug. 10, 2006; Madison, Wis.
Students can expect a very friendly and educational experience when they show up on audition day. I am sure many will be nervous, but we try to get them to be relaxed. This is a get-to-know-everyone time of year. Those auditioning will learn about the program and the staff will get to know them as players and as a person.